-You love painting pets but noses, eyes & fur give you trouble. 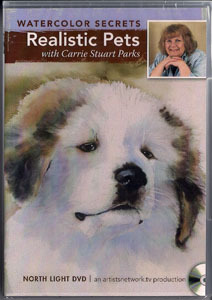 Follow along with Carrie Stuart Parks as she takes you through painting a Great Pyrenees step-by-step. This watercolor painting video demonstration includes 100 minutes of premier art instruction from an experienced artist & teacher. Learn how to paint your pet in a realistic style including eyes, noses and furs. This watercolor painting workshop includes techniques & tips that can be applied to painting dogs, cats & other furry pets.